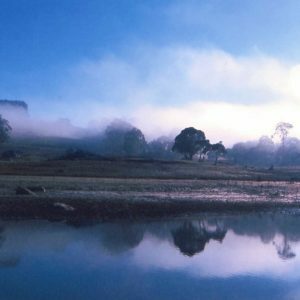 One of the great road trips of the Central Tablelands, which overflows with fabulous scenery and expansive views, is the Tablelands Way. Leaving the hustle of the highway behind at Goulburn, head for the hills and the dreamy town of Taralga, where you’ll find beautiful buildings and a good coffee! Continue on towards Oberon, travelling through some of the most beautiful scenery in NSW. Layer after layer of blue, rolling hills, steep river valleys and spectacular high ranges make this route one to remember. Simply spectacular is one of Oberon’s most alluring features! Roads to and around Oberon showcase some of the most beautiful scenery in NSW. Layer after layer of blue, rolling hills, steep river valleys and spectacular high ranges make this area one to remember. Coming from the south on the Tablelands Way, the welcoming views across picturesque Lake Oberon, with its rock strewn foreshores, alert the traveller that Oberon is near. The route continues beyond Oberon, via the Lowes Mount Road, to the beautiful Tarana Valley, before going through the historic rail bridge after Tarana on the way to Portland and then Mudgee, via the awe inspiring Capertee Valley. There are lots of more challenging drives around Oberon, through State Forests and National Parks, that bring the explorer to secluded and beautiful spots to camp or picnic. One such drive takes the traveller down to the Cox’s River on the Black Range Road. 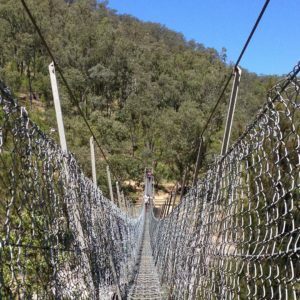 A short walk provides access to the river and an amazing suspension foot bridge. There is a wide range of touring opportunities around the town of Oberon and its villages. For more information, contact Oberon Visitor Information Centre. Motor bike riding is very popular in the Oberon area, with quiet roads providing some great riding experiences. There are a number of round trips from Oberon that provide wonderful scenery, as well as some challenging riding on bends and hills. One such ride is the road to Jenolan Caves, which offers the bike rider some lovely views and some exciting corners! Travel to the caves via Edith, stopping at the newly renovated cafe before continuing through the Grand Arch to make the return journey to Oberon via the Duckmaloi Rd. Another short ride takes in part of the Tablelands Way, leaving Oberon and travelling via Black Springs to Porters Retreat and then back along Shooters Hill Rd. Oberon regularly sees bikers stopping in town for a coffee or a meal on their explorations around the area! For those who choose to stay a little longer, there are lots of round trip options for some pleasant days’ riding. The Visitor Information Centre has brochures with suggested touring routes for both bikes and cars.